mic.o.mic Build & Play toys are a fantastic range of construction vehicles that are made of high quality, textured plastic. Pieces are bold & bright with accents of black to create an eye catching and modern looking model! Distributed by Alyss Toys in the UK, mic.o.mic toys are designed and manufactured by German company Schaefer. The models are put together by using a unique 'clip & pin' system; durable black strips together with small clips attach the pieces together securely but are easily taken apart again to be re-assembled as many times as desired. Once built, the models remain strong to withstand continuous play. 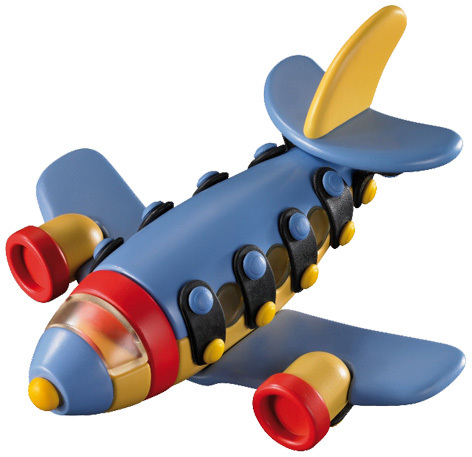 Functional parts, such as wheels and propellers allow the toys to be played with like modern collectable vehicles. Cleverly designed boxes have a lifting flap so that consumers can view all the contents before purchase. Simple instructions are printed on the inside of the box lid and encourage children’s problem solving skills by working as a team or by themselves. Available in small, medium or large vehicles, there is a mic.o.mic model to suit all levels of ability.